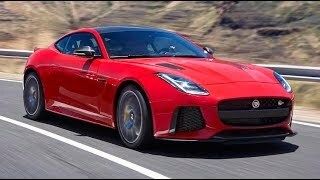 Jaguar F-Type SVR Coupe 2017 comes to be extreme version of the brand with its popular sporty gestures. It features the latest evolution of the Jaguar Land Rover. 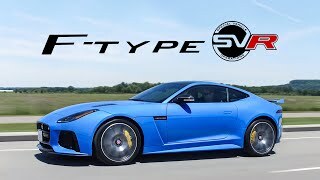 The F-Type SVR is very similar to the limited-edition Project 7 styling-wise, featuring a much more aggressive body kit compared to the R model. 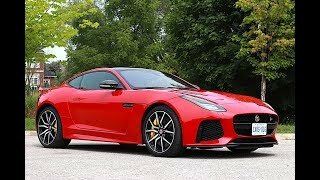 Let us have a close look at the reviews of the superior model Jaguar F-Type SVR Coupe 2017 and find out all the new stuffs incorporated to make it better than the other models. 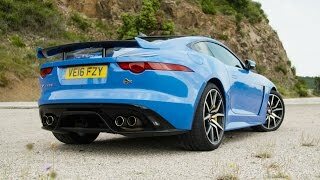 Jaguar F-Type SVR Coupe 2017 has as classy interior as its look. The interior of the SVR is packed with bespoke features that can’t be had with other F-Type models. The seats of the model are wrapped in soft leather with Upholstery options; Jet, Siena Tan or Red, but all of them come with a Lozenge Quilt pattern, contrast stitching, micro-piping, and headrests embossed with the SVR logo. The steering wheel is also unique to this model available with either Jet leather or Jet leather with suede cloth; it features black-painted spokes, and contrast stitching in a range of four colors. Standard features also include the touchscreen navigation and infotainment system with SiriusXM Satellite Radio and HD Radio, the 770-watt Meridian sound system, InControl Apps, and InControl Protect emergency and breakdown call system. In addition Standard features also include the touchscreen navigation and infotainment system with SiriusXM Satellite Radio and HD Radio, the 770-watt Meridian sound system, InControl Apps, and InControl Protect emergency and breakdown call system. 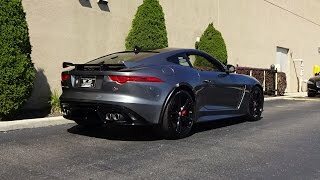 The exterior of Jaguar F-Type SVR Coupe 2017 has classy sportier appearance and awesome look. It has much aggressive body kit compared to R model. In front, the most noticeable change lie in the bumper, which received massive intakes on each side of the main grille. The outlets are identical to the Project 7’s as far as size goes, but they’re shaped a bit differently and have black vertical inserts toward the outer edge. There’s a large splitter that seems thinner than the Project 7. The grille on the other hand, remained unchanged from the F-Type R, sporting the same horizontal bar below the Jaguar emblem and "SVR" logo. There are black-painted mirror caps instead of the regular body-colored elements and new forged wheels that are 22 pounds lighter than the standard rollers. The wing is also smaller than the Project 7’s, but the extra downforce it provides should give the SVR enhanced aerodynamics and stability at high speeds. Jaguar F-Type SVR Coupe 2017 is powered with the supercharged, 5.0-liter V-8 available in all performance-oriented Jaguars and Range Rovers. The total power output is 575 hp and the torque offered is 700 nm SVR Coupe is capable of knocking 0-60 mph sprint in just 3.5 seconds while the top speed touches a 200 mph mark.